Happy Eggs Benedict Day! That’s right. Today is National Eggs Benedict Day. 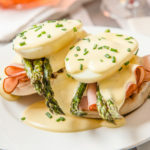 We couldn’t be more excited because, of all the brunch options out there, Eggs Benedict is easily one of our favorites. And with all this spring weather, who doesn’t want to enjoy brunch? So grab a mimosa and a seat on the patio. We have a delicious (and easy!) Eggs Benedict recipe coming to a breakfast near you. Microwave butter in a microwave safe container on HIGH for 1 minute. Place egg yolks and lemon juice in blender jar. Cover and blend on pulse a few times, then blend on HIGH for 1 minute, gradually adding melted butter until mixture is thickened and smooth. Preheat Breakfast Sandwich Maker until green ready light comes on. Lift cover, top ring and heating plate. Place bottom half of 1 English muffin, split-side up in bottom of Breakfast Sandwich Maker. Top with 4 spinach leaves and 1 slice of Canadian bacon. Lower cooking plate and top ring. Add one egg to cooking plate. Top with 1 top half of English muffin, split-side down. Slide out cooking plate by rotating handle clockwise. Lift cover and rings; carefully remove sandwich with plastic spatula. Repeat with remaining ingredients. I love Eggs Benedict and order it at brunch all the time. I never, ever made it at home. To me, it was stuffy and labor intensive. Not to mention I had to poach eggs, which is the equivalent of retaking the SAT’s (they were hard for me). And whisking up a Hollandaise sauce can be on the complicated side. Two products have made this seemingly elaborate brunch staple easy, easy, easy. The Hamilton Beach® Egg Cooker will poach eggs to perfection while you toast the english muffins. No boiling water, adding vinegar, swirling or stirring needed. To see everything the Egg Cooker can do, watch the video below. 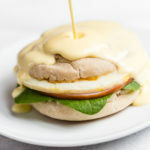 As for the sauce, our Single-Serve Blender allows you to put in all the ingredients, pulse a few times and have the creamy, buttery decadence that IS Hollandaise sauce. We served it with fruit-infused sparkling water and roasted asparagus. Trust me, try it at home (maybe for Mother’s Day?) and you will be amazed by the simplicity. 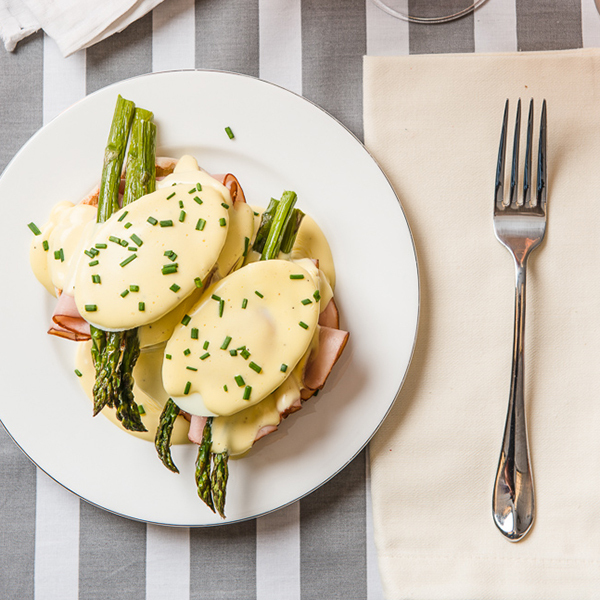 Hollandaise sauce can seem intimidating to maker but not with our Single-Serve Blender. This versatile blender allows you to put in all the ingredients, pulse a few times and have the creamy, buttery decadence that IS Hollandaise sauce.